I've never been a big pet person. We had several cats growing up, and I never minded them, but I don't ever remember having any special kind of bond with any of them either. Then there was our one and only dog, Cosmo. My brother got him for his first grade pet show. Once again, he didn't bother me, but I never really cared too much about him. Well, now I'm a parent and I know why my parents bought a dog just for my brother's first grade pet show (which I remember thinking was a bit outlandish at the time). You do all kinds of things for your kids that you thought you'd never do. My boys haven't had too many pets. We have a nice fish tank, we had a cat, Oscar, several years ago, and now we have our chickens. The chickens have been my favorite pets by far, and I've discovered that I may be a bit of pet-person somewhere deep inside. I'm pretty sure I won't love every pet my boys ever have, but these chickens have taught us (mostly me, actually) many lessons. Here's what we've/I've learned. 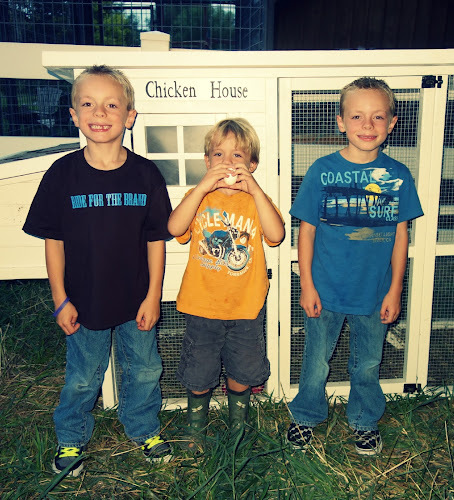 My boys so desperately wanted these baby chicks back in April. At the beginning, it was extremely easy to have the boys help feed the chicks, change the water and bedding, and everything else. It's been several months. My boys don't exactly jump for joy when it's time to take care of the chickens (in fact, many days it's quite the opposite). I do like how my boys have learned responsibility through this. 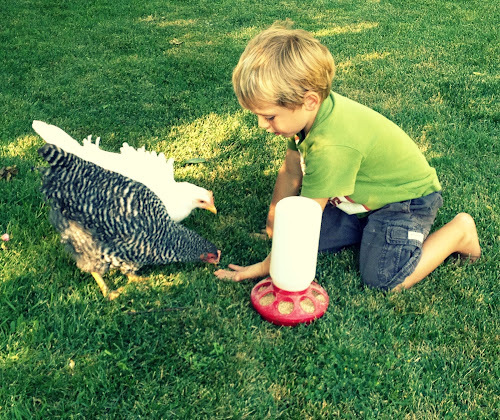 Every time they complain about getting food and water for the chickens, and now checking for eggs, I just remind them that they wanted them, the chickens can't change their own food and water, there are many kids who would love to have a pet to care for, and they need to be responsible. I feel like I should be paying my chickens for their babysitting services for my three-year-old. I've thoroughly enjoyed having my three-year-old home with me while my boys are in school all day, but the last hour or two before we pick up the twins from school can be a bit long. I know he's had enough of me when he says, "I'll just be outside mom." I love to look out the window and see him talking to the chickens, feeding them, chasing them out of the vegetable garden, checking for eggs, and holding them. They really are his little friends. It's priceless to watch! And the feelings are mutual. Those chickens come running whenever they see him. My boys have never had someone close to them die. The day after we got our baby chicks, one of them died (we did buy another one, two actually, to replace it). It was heart-breaking. He belonged to one of my twins. He was devastated. We made a rock headstone, buried him in the field, took flowers out, and stayed awhile. 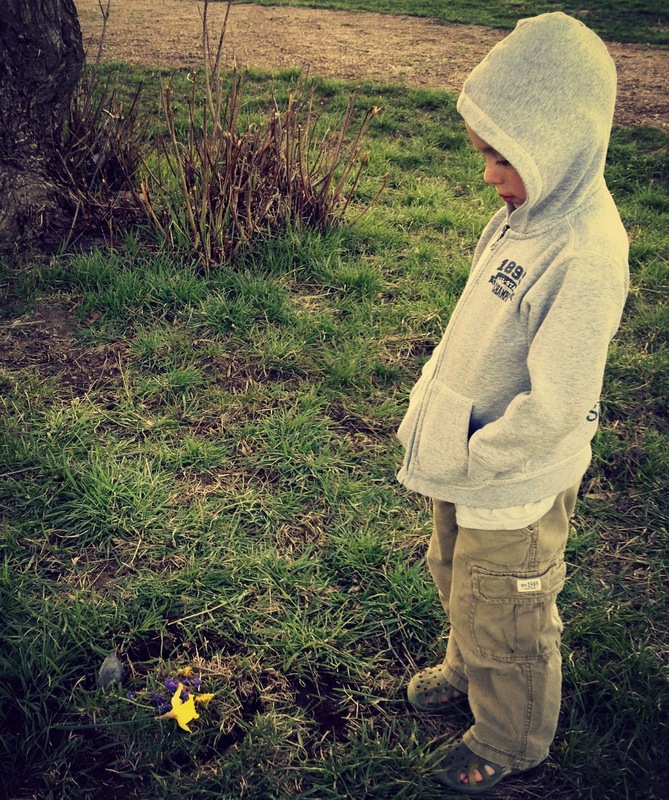 Just seconds after we'd gotten back in the house, my darling little boy asked if I'd go back out with him to where his chick was buried. I went with him, and the tears stared to flow. He was so sad, but didn't want to cry in front of the whole family. It was a moment I'll never forget. He cried, and I even cried for him. We talked a lot about life and death. It wasn't easy, but such a great learning experience for him! What have your pets taught you? I know there are many other lessons to be learned. I'm sure there are lessons ahead that I won't appreciate too much, but I do have to say I'm convinced there is great value in caring for an animal. I always had a pet growing up of some sort (dog, cat, sheep, goat and horse) and I know it taught us responsibility because my mom would tell us that we weren't going to eat until we feed our animals. At times we had to go out in blizzards to feed. I know the responsibility grew into pride and further enjoyment. My son is almost 4 and we gave him a fish for his 3 year old birthday and I have seen the change in him as he is responsible for keeping something else alive. I love what you said about responsibility turning into pride, and then into enjoyment. That's exactly what happens. It often takes time, but it happens. Thanks so much for your comment!! Come back anytime. Enjoy your day! I am a huge animal lover and had pets growing up. Both of my girls are animal lovers too. We have a dog, 3 guinea pigs and a goldfish. Over the years we've had hamsters, gerbils, guinea pigs and fish. Pets teach them responsibility and compassion for others. 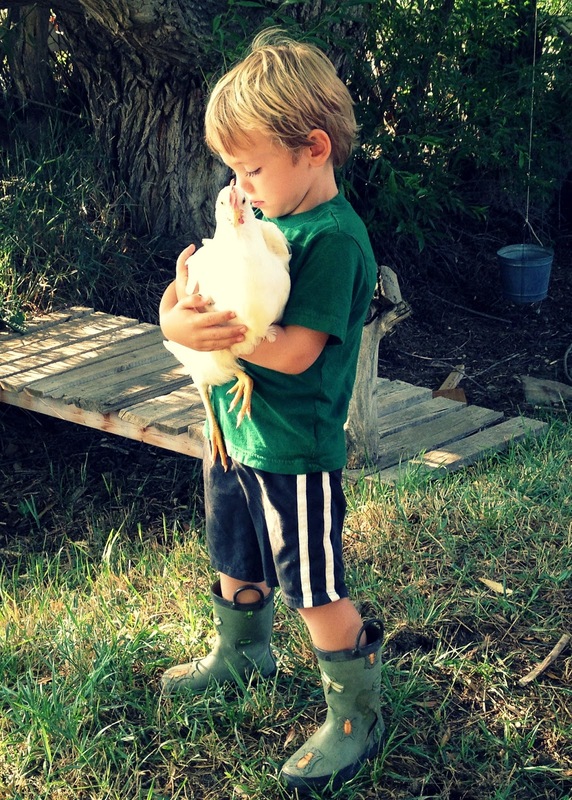 I love how your 3 yr old plays with the chickens and they recognize him and come running. Too cute! Thanks for sharing your pet story. Hi, Lori! Thanks so much for your comment! You have had a bunch of pets it sounds like. I'm slowly growing into an animal person. I'm glad I have kids, because I don't think I would be otherwise. Thanks again for stopping by! Have a great weekend, and come back anytime!